"I am a digital collage artist/surface designer. Using my own photography, i create imaginary landscapes and designs that can be applied to various surfaces: fabrics, tiles and wallpapers." Bruce Samia is a digital collage artist and surface designer living and working out of Los Angeles, Ca. A Boston native Bruce is a graduate of Vesper George School of Art and New England School of Photography as well as studies in print making at the Museum of Fine Arts in Boston. 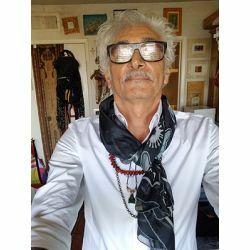 His work has been included in shows on both the east and west coast, including many private commissions..
His works are created using his own photography. Images are manipulated, distorted and layered to create visual landscapes that can be used on various surfaces. ie: wallpapers, fabrics and tiles. silk-scarf/sarongs. designs may be applied to fabric yardage.